A video by Jan Kath and Label STEP celebrates Nepali carpet weaving as a sustainable alternative to migrant labour. A new video produced jointly by fair trade organization Label STEP and Jan Kath, renowned designer of hand-knotted carpets, inaugurates and is the centrepiece of a campaign to promote the benefits of carpet production as a key industry in Nepal and a critically important employer for the developing country’s people. The eye-opening yet inspiring music video is entitled ‘Nine Million Stars’ – the number of stars in the sky according to Nepali folklore. All of that however could have been learned by reading the Label STEP press release on social media, or by staying on top this and other aggregated news by reading ruginsider.com. 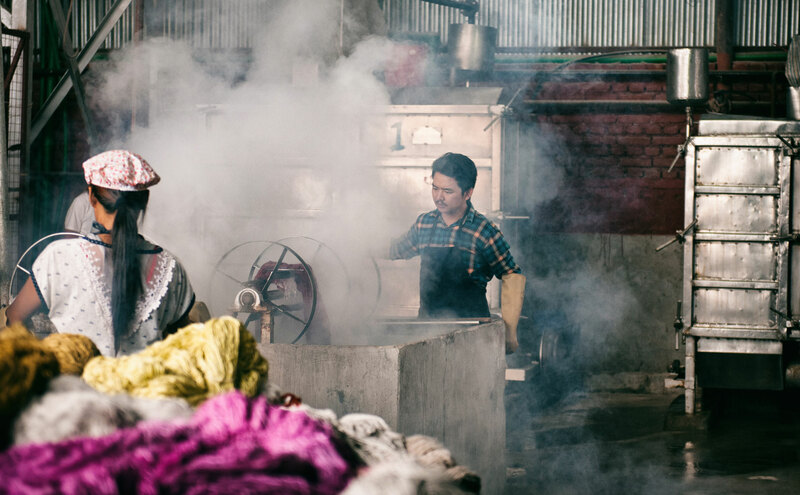 So while the video is available later in the article (or not if you so choose to skip ahead now) first a bit of backstory as to why campaigns like this are essential if the weaving industry of Nepal is to not only survive but to once again prosper. This still from ‘Nine Million Stars’ summarizes the video’s theme of a good life at home under the Nepali sky. | Image courtesy of Jan Kath. There is a certain penchant on the part of carpet purveyors to romanticize the notion of carpet weaving as a storied, well respected, and almost nobel profession. Skills are extolled, the art and craft are professed as sublime, homage is paid to the hard work and talent of those who make carpets, and the resultant product is held as high example of handwork and human artistry. And why not? 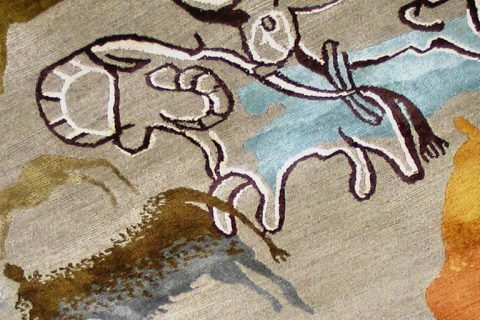 The ability to create woven cloth from fibre dates to time immemorial, with estimates dating this skill to some 27,000 years ago. And while pile carpet construction, as evidenced by the Pazyryk Carpet, dates to perhaps only the more recent but still sufficiently historic fifth century BCE, it is safe to state unequivocally that weaving has been important to the development of humandkind. But, for such a noble and profoundly important profession, ‘How many handweavers do you know here in the west?’ I ask rhetorically. ‘Few’ would be the answer, if one was to be sought. This is a simple matter of economics; one that has long pitted disparate interests against one another in the purist distillation of capitalism as an extension of basic (human) behaviour: competition. There are so few hand weavers of fabric anywhere in the world, let alone here in the west, because Luddites lost out to mechanization in the early nineteenth century. And while it is true the global battle of the forces of mechanization and more importantly robotization have yet to relegate carpet weaving to a similar historic fate, they are advancing at a rapid pace. In addition, in a global economy such as ours today competition comes not solely from machine, but also from other countries or regions offering incentives in various forms which result in lower production costs, and simply from other employment opportunities (jobs) – at home or abroad – which offer higher wages. Regardless of the specifics, there are many pressures on the handknotted and handwoven carpet industries. Ones that if left unchecked will render the industry null. Noted Nepali stage actor Tika Bhakta Jirel is shown during filming of a dye shop scene in ‘Nine Million Stars’. | Image courtesy of Jan Kath. As economies improve, the manual labour of weaving becomes less attractive for a variety of reasons including but not limited to wages. Over time, weavers demand higher wages, rightly so if we are to believe the notion that all people should be able to have shelter, and food, access to education, healthcare, and the like. This is actually what people who go into weaving are looking to do. They aren’t looking to get rich, they are looking to make a simple basic living. ‘Weaving has been viewed by people in the villages as a first job where they can earn money for the first time. They view it as a work in the capital city where they do not have to work outdoors and without heavy physical effort. It is the first time they are earning money and becoming self reliant. When asked what attracted them to work in the carpet industry, we have mostly heard that it was a way for them to earn money so they could buy new clothes, have full food, buy the goods they wanted and send some money back home. 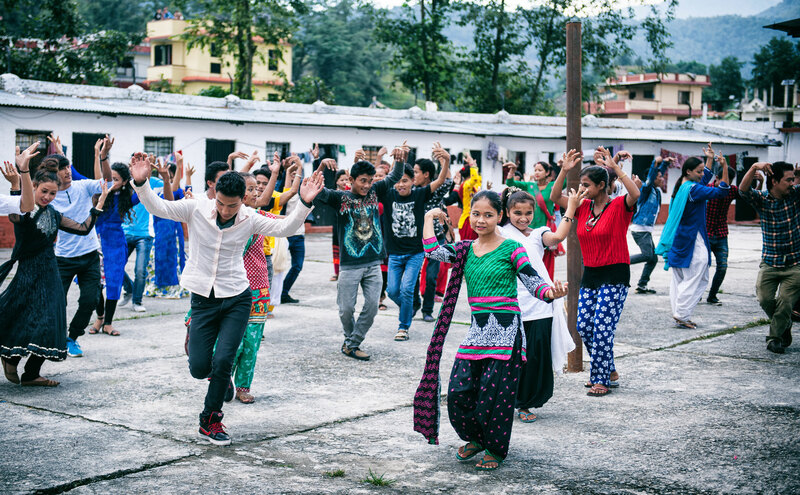 It is a way for them to break out of their [sustenance] farm life in the [rural] village.’ according to Bishal Rana, Nepal Country Representative for Label STEP. Simultaneously there is continuous downward pressure on pricing at various levels from import price to retail and all points in between. Some believe that the industry will be further maintained by keeping wages in check in order to keep Nepali made carpets competitive in a global market that has handmade carpets – from say a handful or so of countries – competing in various growing economies around the world. ‘Another challenge immediately impacting the Nepal carpet industry has been price increases that importers have been experiencing over the past few years. It’s a simple fact, Nepal rugs are getting priced out of international markets such as America. If buyers cannot afford the rugs, they simply will not buy them and will turn to alternatives on the market.’ according to Steve Cibor, Founder of Tamarian Carpets in his interview in the January 2017 Issue of the Nepal Carpet Exporter’ Association publication, ‘Nepal Carpet’. He is right, this is true. Countless examples from every industry exist. Cibor has many other keen observations in this interview if you have a chance to read it, by the way. One amongst them is the same ’employment opportunities (jobs) which offer higher wages’ I mentioned earlier and which plays the role of passive antagonist in this video, though Cibor is more direct. ‘Working as migrant labourers in the Middle East.’ to succinctly paraphrase. They do this to do work the people in the host countries do not want to do for themselves. The wages paid are low by the host country’s standards – hence why locals won’t do the work – but are very appealing to Nepalis who are just seeking the basic necessities in life. The work is dangerous and many Nepalis die of workplace injuries. The most poignant scene in ‘Nine Million Stars’ dramatizes the mortal danger of migrant work, drawing attention to the negative effects it has on Nepali society. | Image courtesy of Jan Kath. We as relatively spoiled westerners don’t fully grasp this more visceral desire and so I am not certain we can be critical thereof. Regardless, I feel confident saying it is not unreasonable for people to want to improve their lives. Look around your room, look around my room, now look around theirs. To say to them otherwise is to ignore the most important lesson we should have learned from global human history: That all men and women, humans to cover all the contemporaneous bases, are equal and deserving of mutual respect. If a living wage cannot be paid, then the industry will simply wither away as human capital moves on to more financially appealing opportunities. Managing Director Reto Aschwanden, Country Representative for Nepal Bishal Rana, and Uma Nath Dhamala, Field Officer (left to right) all of Label STEP watch on during filming of ‘Nine Million Stars’. | Image courtesy of Jan Kath. 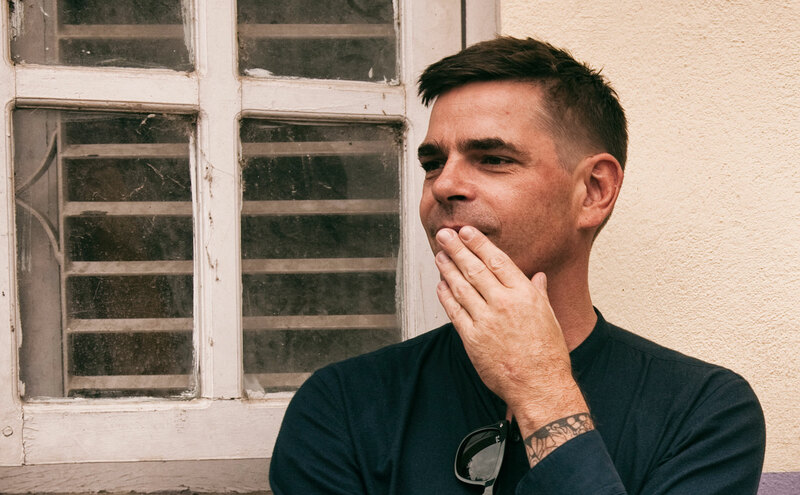 ‘We decided to take action instead of just talking about the decline.’ said Reto Aschwanden, Managing Director of Label STEP. 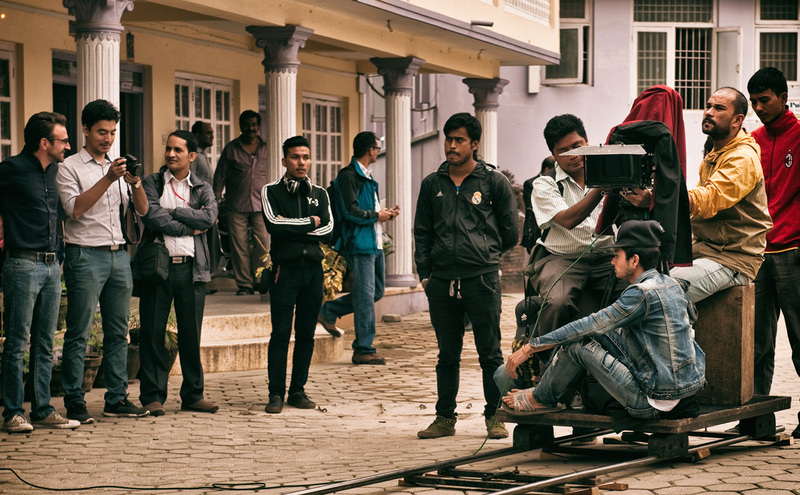 ‘To shine a positive light on the industry and Nepali culture. The video highlights one good example [carpet weaving] of an industry that can help Nepalis.’ Carpet weaving, at a livable wage – comparable to or better than dangerous foreign labour – so that Nepalis can preserve their culture and society at home, with family and loved ones, is what this video is all about. It is about Nepal not as a source of cheap labour to be exploited by the highest of the lowest bidders, but as a country of proud people. 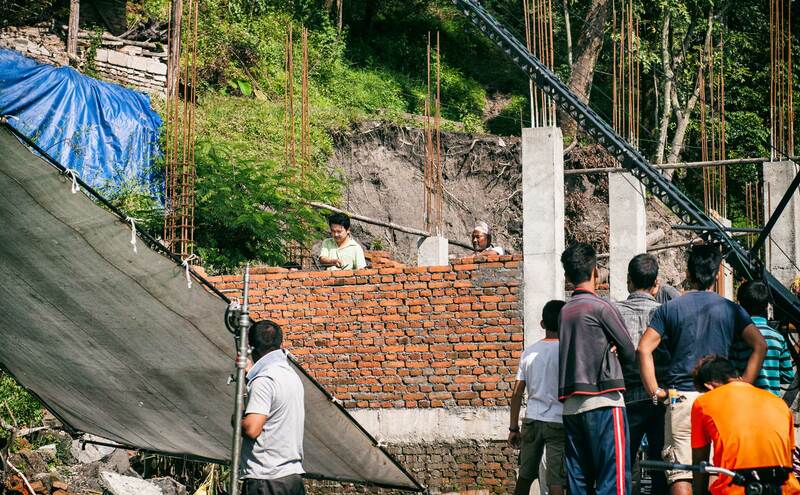 Noted Nepali stage actor Tika Bhakta Jirel is shown during filming of this house reconstruction scene in ‘Nine Million Stars’. | Image courtesy of Jan Kath. 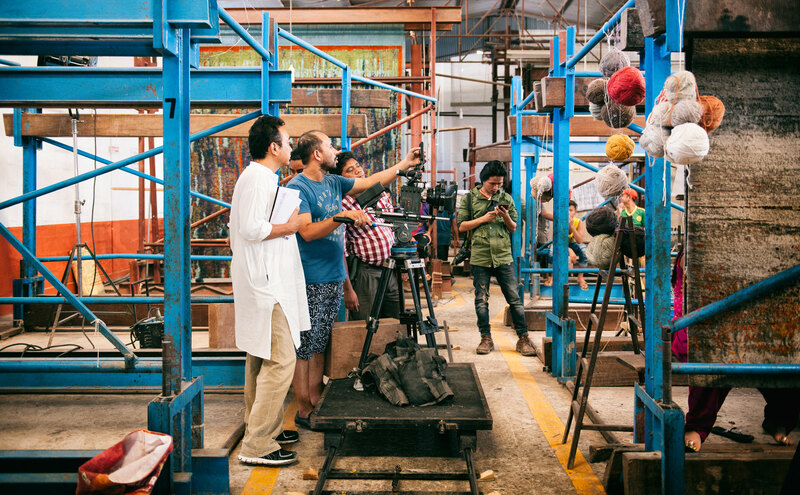 Jan Kath looks on during filming of ‘Nine Million Stars’, a joint project between his eponymous firm and Label STEP, intended to attract workers to the weaving industry of Nepal. | Image courtesy of Jan Kath. Director Tsering Rhitar Sherpa (left) readies for filming of a weaving scene in ‘Nine Million Stars.’ | Image courtesy of Jan Kath. ‘Nine Million Stars’ is a bold, contextually relevant, appealing first public step to help build the cache of weaving, transforming to from an initial job into an attractive, respected and well-paid career. 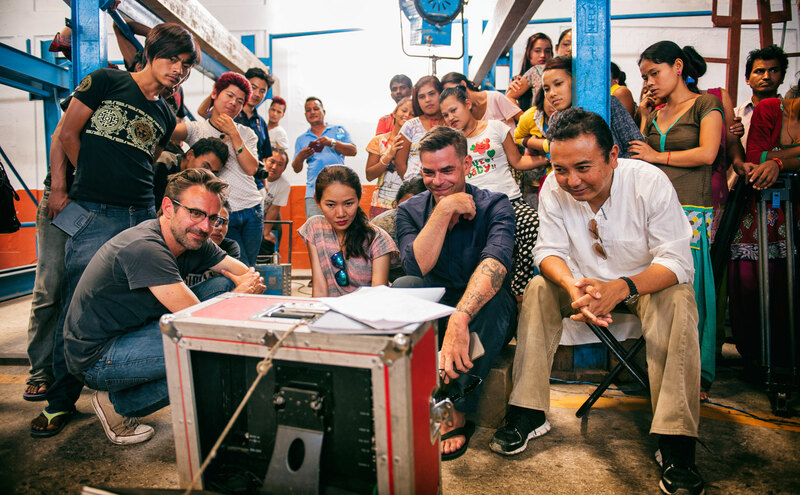 Weavers look on as Reto Aschwanden, Managing Director of Label STEP, Nairat Thanompiew and Jan Kath of Jan Kath, and Tsering Rhitar Sherpa, of Mila Productions and director of the video (foreground, left to right) review daily footage of ‘Nine Million Stars’. Shot at Jan Kath’s manufactory in Kathmandu, ‘Nine Million Stars’ celebrates Nepali carpet weaving as a sustainable alternative to migrant labour. | Image courtesy of Jan Kath. Returning then to my theory that competition is at the root of this, it is worth revisiting, if only in a cursory manner, the previously mentioned competition from ‘other countries or regions offering incentives in various forms which result in lower production costs.’ In short and without too tedious a discussion know that Cibor is right in his assessment that customers will seek out ‘alternatives on the market’. They already exist. In the past, and perhaps to a fault, the ‘people standing behind the industry’ to quote Kath broadly, successfully promoted Tibetan weave carpets as the epitome of quality, modern, artistic carpet production. This was done without real regard for the attention span and interest level of consumers and trend driving shelter publications, ignoring the fact that for most people all so-called ‘Tibetan’ carpets are the same. We as educated carpet aficionados know this to be otherwise, but the fact remains a Tibetan weave carpet made in India (some would argue of inferior materials) is no different in the eyes of the average consumer than a Nepali made Tibetan weave carpet. Period. Furthermore, if the Indian made carpet is less expensive (which it likely is), it is going to win out in a simple aesthetics and price driven competition. In short, not only is the carpet industry in the developing country of Nepal competing for labourers with other higher paying jobs at home and abroad, it is competing with other developing countries in a global marketplace. Nepali actress Reecha Sharma and Nepali stage actor Tika Bhakta Jirel enjoying a laugh during a break from filming of ‘Nine Million Stars’. | Image courtesy of Jan Kath. To bring some context to this discussion and to illustrate concretely the pressures on the Nepali carpet weaving industry, I would like to call to your attention the decline in production in Nepal over the past fifteen (15) years. In 2000/2001 – a split Gregorian year as the Nepali calendar does not coincide – Nepal exported some 2,242,692 sqm (~24 million sqft) of carpets, this according to statistics from the Nepal Carpet Exporters’ Association. For the year 2015/2016 this had decreased to 605,294 sqm (~6.5 million sqft). These figures do not control for the reasons in changes in output, but for simple illustrative purposes it is without hesitation safe to say the volume produced by the industry is in decline. While I personally feel there will always be a place in the world for fine handwoven and handknotted carpets, I cannot speak with any certainty as to the future size of this market. Eventually improving and developing economies around the world will drive the cost of production so high as to make it unsustainable on large scale due to lack of consumers willing, or more importantly, able to afford such wares. The turning to alternatives Cibor warns against is not hypothetical, China’s production has already largely been priced out of the handmade carpet market and with no foreseeable reasons to indicate otherwise it is likely to happen elsewhere, including Nepal. This is especially prescient if the final, though perhaps original competitor on the scene is re-introduced: mechanization. The Luddites were simply people who earned a living by weaving cloth. They were no different than a weaver in Nepal, or India, or anywhere else for that matter today. They were people just striving to live, to have food. They rightly feared the loss of their jobs to mechanization just as so many people today have the very same fears, though perhaps at no point heretofore in human history has the threat been so broad, affecting employment across all sectors not just manual labour, but I digress. There have been immense increases in the quality and visual appeal of all manner of automated carpet production, and in the long run it is all but unimaginable to envision a time when some manner of less expensive production – be it tufted, machine produced, or something not yet realized – will be not only the predominant type of rug one can buy, but also the high end one as well. ‘Handtufted carpets will be the high end of the rug market in fifty (50) years.’ says Rob Leahy of Fine Rugs of Charleston as quoted in article ’10 Highlights’ in Issue 2/17 of ‘Carpet XL‘. The above is the Nepal specific video without captioning and with a voiceover message (in Nepali) which translates roughly as: The creation of Nepali labour, skill and art – handmade carpet industry is a beautiful place for employment of Nepali people. We can live happily in our home and with our family by weaving carpets instead of taking high interest loans, selling our home and farms and going abroad. Our passion – Nepali Carpets. Let’s all get together – for Nepali carpet production and market promotion. Let’s respect the labour and skill spent in our own country. To argue against Cibor, Kath, Aschwanden, Rana, or Leahy is to ignore that each of them is right. There are immense economic forces currently at play, all of which try to minimize cost of production as to ensure availability of carpets priced such that the market will support their production, markup, and distribution. But what if anything is to be done? The handmade and handwoven sector of the broader rug and carpet world must come to terms with the fact that our current model is going to fail over time. The inability to keep wages (and all costs) in check will increase the price of Nepali carpets, potentially pricing them out of the market. Keeping wages ‘in check’ – which is the polite way of saying ‘low’ – however is not a long term solution. As developing countries develop the forces of inflation and competition will lure away labourers to other higher paying jobs. Furthermore – if I might interject just a bit of haughty thought – for any one human to say to another: ‘You must work for wages so low that you cannot have even basic comfort in order for me to have a product I do not need to live.’ is akin to slavery in another form. [Editor’s note: No one quoted herein is stating this, nor am I implying anyone actually thinks this way. I am illustrating the end game of this complex situation through hyperbole and example.] It is unfathomable that anyone should feel so entitled as to demand one person live below the poverty line so that another can live in luxury. In order to avoid runaway inflation wages must account for ‘good and acceptable local standards’ as Kath reminds, but this does not mean suppressing our fellow man. Leahy has researched the changing markets extensively, presenting on the subject at the inaugural Istanbul Carpet Week, and while I would love to take exception to his prediction, it is hard to argue against him when faced with innumerable examples from other industries. (I’ve made his paper available for download here, if you have the time for another twenty-two (22) pages of reading. EDITOR’S NOTE: Mr. Leahy provided an updated version of his paper to The Ruggist on 23 June 2017. The revised version includes updates on the effective impact of the former Iranian rug embargoes.) Factoring in an explosion of newly empowered consumers in vastly large and emerging markets, it is unimaginable that the current model will be able to supply the demand. Whether handtufting will be the high-end holdout is yet to be seen, but less expensive means are certainly going to dominate the overall market. For years I have thought about the notion of a robotic knotting machine. One that can mimic the structure of a hand tied knot, regardless of the specifics of that knot. In my mind this machine has a knotting head which can work tirelessly, without break, twenty-four (24) hours a day, seven (7) days a week, fifty-two (52) weeks a year. I used to think it required a changeable head that switched between colours of yarn, but no more. Envision a continuous supply of yarn, dye printed in sections just big enough to tie a single knot of a single colour. Now imagine the resulting carpet. Millions of knots each potentially a unique colour, knotted not by hand, but by machine in continuous and expeditious motion. The cost of the carpet would be relatively low, and the beauty would be magnificent, the pantheon of human weaving prowess. It would be the digital high-resolution version of an analog product if I may interject such an analogy. 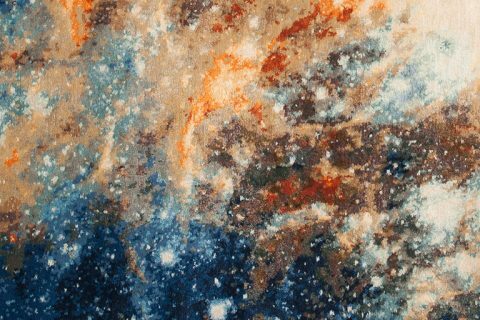 Weavers were cast as dancers to celebrate life ‘shining brightly at home’ in ‘Nine Million Stars’. A joint project between Jan Kath and Label STEP, the video celebrates Nepali carpet weaving as a sustainable alternative to migrant labour. | Image courtesy of Jan Kath. In the end (which is near I promise) it matters not whether the competition for labour comes from other industries, other countries, or mechanization. It matters that it exists and that it will eventually eliminate this type of manual work if the industry is unwilling to adapt. If the industry is to even attempt to prove Leahy wrong it must now begin to rethink the current model and make the necessary changes to revitalize our industry ‘…even if this means that rug making becomes significantly more expensive over the next few years to come.’ as Kath said. ‘It depends on the size, but a normal room size carpet can take up to four or five months to produce. We have four to five (4-5) weavers weaving each rug, and another four to five (4-5) people who are suppling the raw materials, so you could say that up to ten (10) people have worked on each piece for five (5) months. That describes the value.’ – Jan Kath as quoted by Vogue Living Australia in their recent feature on the firm and Australian carpet house Cadrys. The appeal of handmade and handwoven carpets is that they are an analog anachronism in an ever digital world. To further this comparison think no further than the allure (to some) of vinyl records. 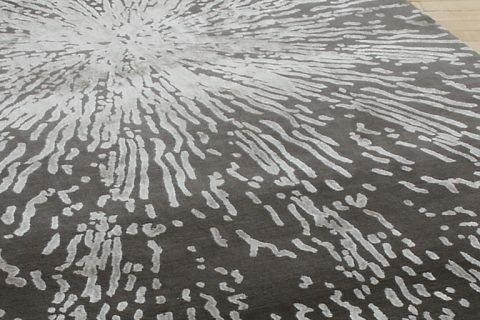 A groove, etched in substrate is the simplest technology we have to record sound, and that same allure will continue to attract (some) people to handmade carpets. The market size is likely going to shrink, but through planning, foresight, and in my opinion a much more concerted branding effort, the portion of the industry that survives will be the one that ‘shines brightly’ under ‘Nine Million Stars’, a fair and equitably made product that respects our fellow man; the ultimate – truly luxurious – floor covering. Is a designed inspired by another or a copy thereof? Is there a difference?